Norwegian pianist-composer Ketil Bjørnstad seems to be in one of the most creative phases of his career. Increasingly, he has turned to the human voice as an expressive outlet for his ever-songlike writing, and it was only a matter of time that those forces should reach the level of a choir, a medium for which he was asked to write music in commemoration of the Nordstrand Musikkselskap Choir’s 70th anniversary in 2011. Having already engaged with the life of Edvard Munch in his 1993 literary biography Historien om Edvard Munch and set the painter’s neglected words to music on the album Løsrivelse, he naturally returned to those same texts for Sunrise. Yet Bjørnstad’s self-styled cantata is more than the portrait of an artist. It is an affirmation of light. Munch wrote flashes of prose in preparation for many of his paintings. Bjørnstad characterizes the texts chosen for this monumental work as dealing unanimously with existentialist dilemmas. 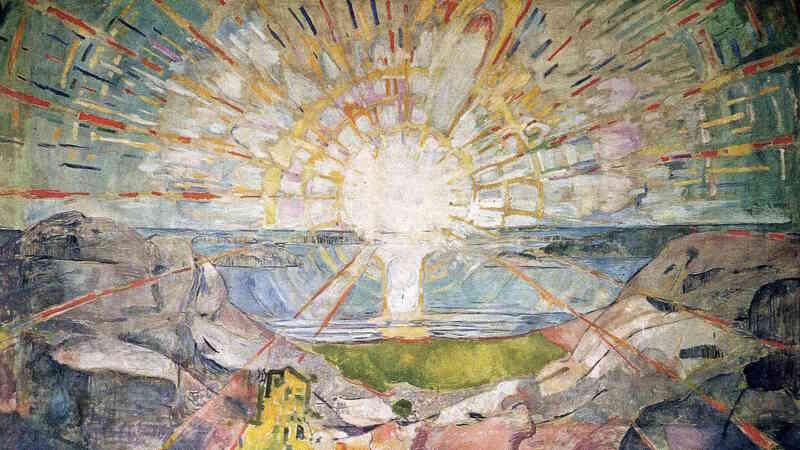 In addition to Munch’s paratextual writings, Bjørnstad was intimately acquainted with his 1909 mural The Sun, under which the young pianist saw many greats play at Oslo’s University auditorium, the Aula, where it hung. In that painting, notes the composer, “one can clearly discern the degree to which Munch struggled with and against the forces of life, and how deeply and endlessly he yearned for enlightenment and reconciliation.” The same holds true for the music he has written into its aura. 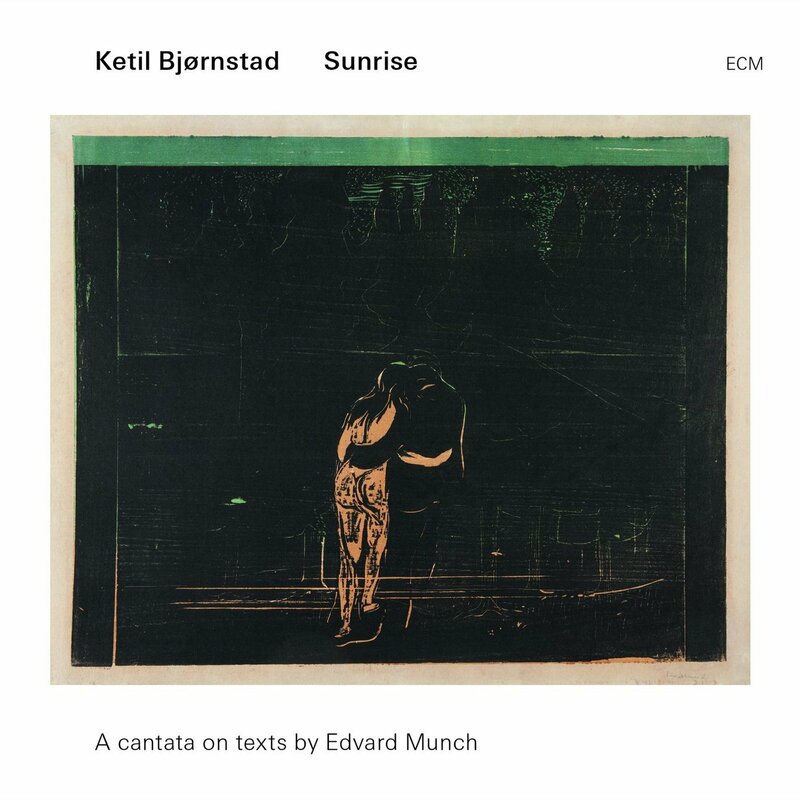 Most attractive about Sunrise is its breadth of idiomatic conviction, which is most vividly clarified in the four songs written for singer Kari Bremnes, with whom Bjørnstad worked on the aforementioned Munch cycle. She is joined by Bjørnstad at the keyboard, alto saxophonist Matias Bjørnstad (no relation, it seems), and bassist Bjørn Kjellemyr on “Moren” (The Mother), which depicts the haunting scene of a young boy who holds his mother’s hand in anticipation of going outside but is blinded by the light of spring once they open the door. Bremnes’s oaken alto lends heart to every word it envelops. In the montuno-flavored “Stupet” (The Cliff), for instance, she evokes a jagged cliff and the dangerous ocean churning below like a death wish. The naturalness of her shading lends intuitive dimensionality to the near-pop groove of “De fineste nerver er rammet” (The Most Delicate Nerves are Affected) and a lover’s wicked thoughts in “Åpent vindu” (Open Window), for which cellist Aage Kvalbein provides the lamplight and Bjørnstad a certain temptation beneath the floorboards. Turning to the sections for choir gets us into some potentially divisive territory. Bjørnstad is clearly not a choral writer, as attested by the fact that the vocal arrangements were done by Egil Fossum, who also conducts the present recording. Certain sections are more memorable than others, such as “En rovfugl har satt seg fast i mitt indre” (A Bird of Prey is Clinging to My Inner Being), which opens the entire cantata with the unlikely ante of a steel drum, courtesy of percussionist Hans-Kristian Kjos Sørensen. Like a warped church carillon as heard through the screen of memory, it breeds a prayerful cello to greet the dawn. The choir opens its lips to greet the titular bird, which traps itself in the chest but which by the grace of song is placated by God’s azure stare. Subsequent moods and images range from the apocalyptic [“Alfa og Omega” (Alpha and Omega)] to the frivolous [“Livets dans” (The Dance of Life)]. Other elements feel more derivative, such as the hints of Samuel Barber’s famous Adagio in “Adskillelsen” (The Separation). More interesting to consider are Munch’s sentiments, revealing as they do a conflicted mind desirous of peace, splashing color across the human psyche as if it were the truest canvas. In “Intet er lite” (Nothing is Small) is nestled his meta-statement: Nothing is small, nothing is large. / We carry worlds inside us. Words to live by for both the painter and his thoughtful composer. Wordless singing beneath the cello’s commentary accentuates an underlying yearning. Even the jazzier inflections of “Joden elskede luften” (The Earth Loved the Air) enhance the starkness of Munch’s inner world, a place where trees uproot themselves and turn into human beings: Everything is alive and in motion. / Even at the center of the Earth / there are sparks of life. This leaves us to bask in the promised “Soloppgang” (Sunrise), which unites musicians and singers in an optimistic flourish that is hard to come by in Bjørnstad’s work. Overall, there is a rustic, hymnal quality to the choruses, which suits the material well enough. More exciting, however, are the three “Recitatives” and “Intermezzos” signposting the program. The former elicit some of Bjørnstad’s most unchained playing on record in bursts of cathartic free improvisation, while the latter weave the piano into melodic shadows of cello or saxophone, each a thread gathered from an open wound and spun into new flesh. Like the protagonists of “Som i en kirke” (As if They Were in a Church), they reveal a gravid awareness of mortality, seeing creation as a church unto itself, and nature as God’s tabernacle.